With the final campaign phase for the much hyped Delhi elections drawn to a close, voting having begun and as the eager wait for election results begins, the political landscape has been completely transformed over the past one month. A few months ago what may have been declared as a straight forward win for the BJP seems to have made a abrupt turnaround by pointing in the direction of the resurgent Aam Aadmi Party (AAP). A series of political miscalculations by the BJP and the politics of the ridiculous pursued by the forces of Sangh Parivar seems to have rattled the middle classes in urban areas especially, putting the BJP on the back foot. Although the Prime Minister – Narendra Modi is still seen among many as the development man and not clouded by his orchestration of the 2002 Gujarat riots. But his silence on many issues lately relating to controversial statements, reactionary demands and attacks on freedom of expression by the Hindutva right wing forces (including members from his own party) has given rise to a feeling that Modi will not do anything to stop them or anything that will antagonize the relationship to his parent organization led by the Rastriya Samajsevak Sangh (RSS). After the AAP’s disastrous decision last year to quit Delhi govt. that it was heading to pursue its national ambitions (which backfired), Delhi has been without a government for nearly a year now. Instead of going for the kill right after the general elections, the Modi led BJP govt. let the elections stall and was thinking of other dubious ways of forming the govt inorder to avoid a direct clash with the AAP. 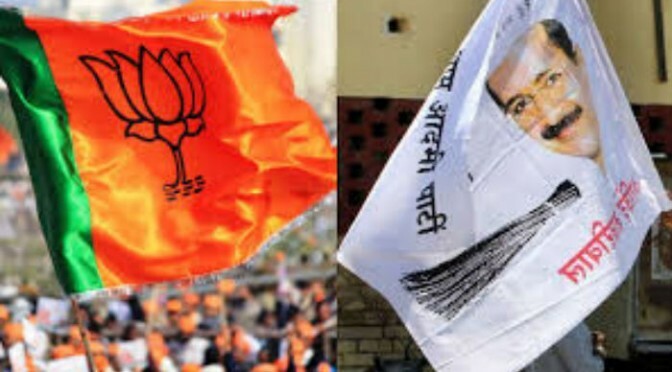 On the other hand, the Modi wave did give the BJP desirable electoral outcomes in states like Haryana, in Maharashtra were it has put Shiv Sena in its place, an opportunistic alliance in Jharkhand once again and more importantly its rise as a player in the Jammu & Kashmir state assembly (were government formation now hinges on BJP support). With Modi’s showmanship on display internationally, it might have seemed inconceivable that the party’s prospects look doubtful in the city-state of Delhi. Being the capital and the high stakes involved, the parachuting of an outsider Kiran Bedi (a former Police Officer and prominent figure in the India Against Corruption movement that brought Arvind Kejriwal to limelight) as its Chief Ministerial candidate has raised several eyebrows. It is still hard to discern what lies behind the thinking of BJP’s master strategist – Amit Shah, which has gone against all conventional approaches of the BJP, upsetting even the RSS. If this was meant to checkmate Kejriwal, it has certainly backfired. Kejriwal is much much stronger today and if anything this move has raised the party’s prospects like never before. 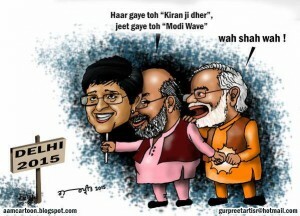 Or if he knew that BJP’s prospects are not so bright due to several factors like the internal disarray in its local unit or a dent in its image due to the Hindutva hyperbole, then this may be a strategy to shield Narendra Modi if the party loses and put the blame squarely on Kiran Bedi. 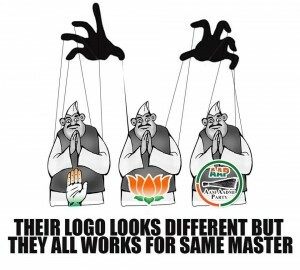 Whatever the Machiavellian thinking, the real game will be played out only after the elections. In the meanwhile, Kiran Bedi has turned out into a laughing stock for the BJP, with her public gaffes going viral and her headmistress like approach putting off many in the BJP. Sensing an imminent disaster, all the forces at its disposal have been marshaled in – the Prime Minister, union central ministers, RSS cadres and even Obama in a way has been brought into the ring to showcase BJP’s or rather Modi’s macho persona. And not to forget, money and muck has also been thrown in, but nothing seems to be working. Whatever last ditch attempt to save face has only severely exposed the rank discontent within the BJP Delhi unit and even if a slim majority is somehow achieved, Kejriwal would still walk away as the real winner in the larger public imagination. 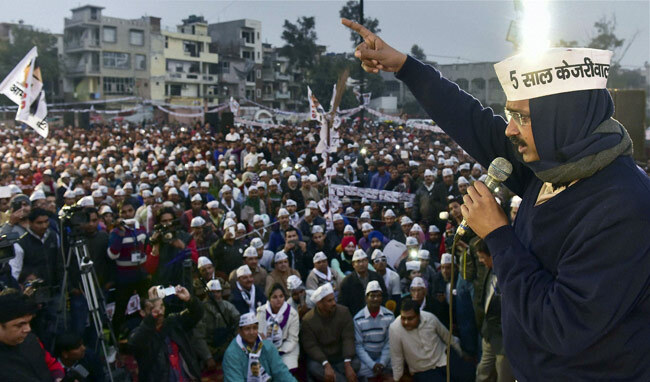 Ever since the Lok Sabha debacle, many had written off the AAP as a spent force. But a look into the anti- corruption movement turned political party trajectory, it seems to find a way to bounce back every-time. 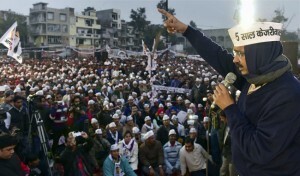 Although now it is very clear that Arvind Kejriwal is a down and out opportunist (eg., using Anna Hazare as a prop during the IAC days, ditching the Delhi govt for his national ambitions last year), and despite his many political mistakes (not counting his party’s incoherent political ideology) he has learnt enough to strategically place himself in the limelight and even skillfully time negative connotations against him into an opportunity. Thus he has partially succeeded in reviving the AAP, atleast in Delhi were it is the strongest. From an anti-corruption plank to personality politics, corruption theme has definitely taken a backseat and this election for the AAP has meant more about the relatively clean image of Arvind Kejriwal. 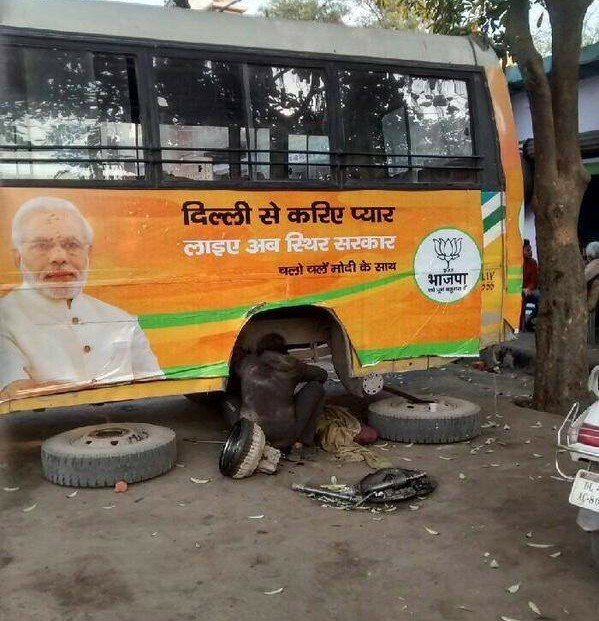 Ultimately it boils down to a sanitized version of capitalism that Kejriwal & co are actually promoting. Yes, the party if it comes to power, may indulge once again in its populist measures like bringing down electricity and water bills without ever connecting it to the larger issue of privatized electricity board etc. If subsidizing is the way AAP plans to meet its somewhat socio-democratic electoral programme, the question will arise where will all the money actually come from? Modi-Shah are certainly not going to sit back and watch AAP have its way in what they now consider to be their personal fiefdom. Delhi government does not enjoy the same powers as other state assemblies and is forever at the mercy of the Central government. While lot of theatrics on the part AAP is to be expected (if it comes to power), but a serious opposition to the BJP, connecting it to the capitalist hold over the economy, is completely ruled out. A better prospect for the AAP might be a stint in the opposition where it can be safely seen as an opposition force and capitalize on a Bedi led BJP govt that is prone to be a disastrous from the very start. A hung assembly is also not ruled which would definitely benefit the BJP as it can rule Delhi by proxy, blame Kejriwal for the mess and buy time once again to stage a comeback. However, such a situation might also bring a scenario like last time with Congress supporting from the outside or one of the independents or other small parties backing AAP to spite the BJP. With many regional parties (including the CPI-M!) calling on the voters to back AAP, nothing can be ruled out. After all if Congress completely fails to revive back nationally, AAP is definitely on the waiting list to take its place as the ‘Congress of the 21st Century’. Just about nearing towards the end of its one year tenure, Modi’s aggressive neo-liberal agenda is only now beginning to bite. Although definitely too soon to say that an opposition is about to emerge against his policies, Delhi elections is showing that all is not well. On the top of that is the revival of the communal agenda by the Sangh Parivar. Although having been reminded of its dangers by none other than the US President Barack Obama (twice), if things go as in the way of Delhi, the RSS will have no choice but to play the communal tune to maintain its grip in power. Any challenge, even of the AAP variety will not be taken lightly by the Modi-Shah duo and serious effort will be on from day one to derail such a government one way or the other. On the other hand, as the AAP starts to slowly shed its populist image to a party willing to be more accommodative to the central govt, it will be gripped by contradictory forces within party pulling in various directions. It is unlikely to be stable ride for the AAP. The initial idealism that attracted youth and especially civil society groups like PMANE are gone to a greater degree and if anything, AAP is trying hard to beat the anarchist image that is often evoked by its detractors. As Marxists rooted in the theory of Democratic Socialism, we do not subscribe to the hotch-potch politics of AAP, which is neither here nor there (especially given its adherence to capitalism). But given its urban middle class base, it must be undoubtedly recognized that a defeat of the BJP in the national capital would be a huge dent on Modi’s image and open up spaces in the rest of the country to mount a challenge against this communal, right-wing govt. With all the confusions that is prevailing (especially with the AAP factored in) these are definitely testing times for genuine socialists. But given the uncertain economic outlook prevailing globally it would be a matter of time before Modi is thoroughly exposed as the ruthless executioner of capital and the working people of this landmass will be all eyes and ears towards alternative political ideas such as socialism. Delhi Election Verdict – A Shift in the Political Chessboard? 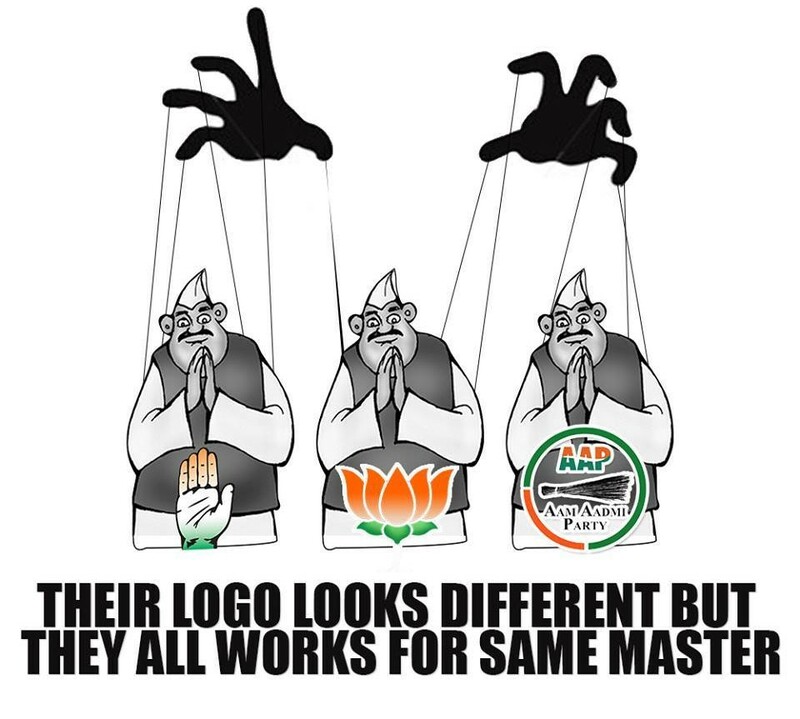 Maharashtra Assembly Elections 2014 – Real Issues Don’t Matter!